Each time I'm around Camargue (South of France, near Montpellier), I try to spend time around La Grande Motte. 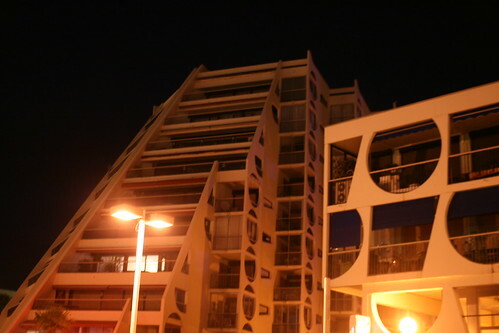 An intriguing beach resort built in the late 60s, early 70s, the place was formerly a desert of sand dunes and lagoons where giant mole hilles ("mottes" in French) has been designed. The architecture was based on the Inca pyramids models in Mexico, designed with terrace systems along with triangular, round and rectangular features to provide wind and sun shields and sea views. In France, bashing this sort of architecture is a sort of regular sport, although lots of people go there and enjoy the place. 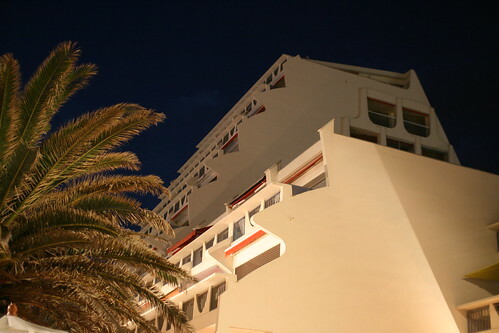 The unity and the coherence of the place is amazingly interesting, and although this city has been created ex nihilo it definitely feels more urban than lots of other beach resorts in the area. Some urban aspects are important: such as the fact that the beach and the building are not separated by a road with cars (but only a promenade for pedestrian and bikes). Wandering around the city after midnight with a digital camera, food bits and flip flops is a curious experience, especially when the place is not yet crowded with semi-naked humans flocking there for the grandes vacances. 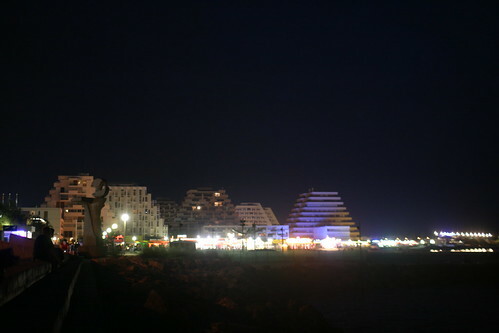 The first picture shows a global view taken form the harbor showing the odd ambiance mixing modernist architecture and weird lightings. The other pictures I took give the impression of a retrofuturistic spin that you can also get when you go to University of California Irvine. 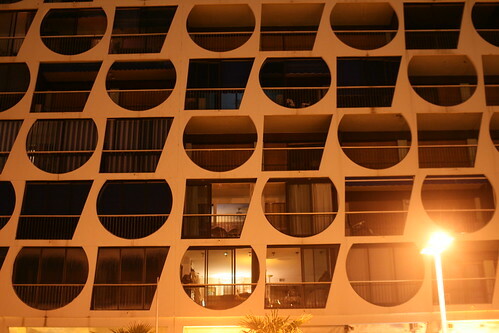 Strange angles, fantastic cladding textures are also deeply intriguing in this night atmosphere. Lots of small details, big shapes that you discover and rediscover and stumble across a group of teenagers riding their bikes on curved shapes, old cats trying to get some food and a lost tourist sat on the beach with a laptop. Lots of people consider this sort of urbanism as a big (and ugly) failure, I don't by that argument and I would be interested in scratching more the surface to understand what works and what doesn't to understand how that modern urbanism project has some good lessons to draw. Surely the low presence of cars would be an interesting topic. Also, I am pretty sure the infrastructure layer of the city may be fantastic to inspect more closely.